Holy basil (Ocimum sanctum) is an herbaceous plant native to India. It is known as tulsi. It is devotional in the Hindu religious tradition and is considered as one of the most significant plants used in Ayurvedic medicine. In India, you will see holy basil growing in plenty around Hindu temples and will find in most of the Hindu home. It comes in red and green types, both with a strong, charming aroma. Holy basil has been used for centuries to deal with a variety of medical conditions. Below are some information about tulsi plant and its medicinal use. Today every person had to deal with Stress; it is a normal and natural part of everyday life. The stress generally occurs when the situation is beyond our limit, and we are not able to deal it. The adrenal glands release stress hormones like adrenaline, corticosterone and including cortisol, which boosts the energy and strength to fight against it. Stress hormones play an important role in inflammation, immune system responses and metabolism. Continually levels of stress can increase cortisol and corticosterone; our digestive system is weakened. This can lead us to depression and anxiety; our immune system is suppressed and led us to sickness or even autoimmune diseases. Holy basil or so-called tulsi functions as an adaptogen it enhances the body’s natural response to physical and emotional stress. The tulsi as an adaptogen herb does not alter mood but rather helps the body to lower the stress hormones and helps the body to function optimally during times of stress. Tulsi is an herb that can effectively be used for many eye ailments; it can be a best remedy for eye care. There are many eye-related ailments such as boils, conjunctivitis, which is generally resulted in due to fungal infection, viral or bacterial and vitamin A deficiency. Tulsi has high anti-oxidant properties of its essential oils and vitamins like vitamin A, vitamin C, etc. Due to this property’s tulsi can be helpful to deal with viral infections of an eye. Soak few tulsi leaves in water, simply wash your eyes with water. Routine use to tulsi can protect an eye from all the damages, which is caused by the free radicals, such as macular degeneration, cataract, glaucoma, conjunctivitis, ophthalmia, vision defects, etc. The essential oils present in tulsi such as eugenol, camphene, carvacrol, methyl chavicol and cineol have excellent sedative, analgesic anti congestive and disinfectant properties. 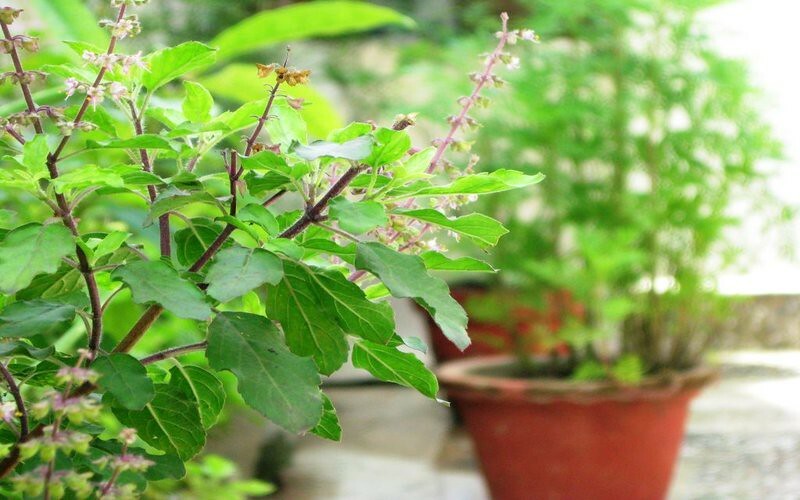 Tulsi is a plant that has many medicinal properties. It has an excellent analeptic effect that can heal the mind as well as the body. Tulsi as an antioxidant and anti-inflammatory properties reduces inflammation by maintaining the nerves and the tissues that are damage by harmful free radicals. It stimulates peace, calmness and enables the mind to stay peaceful and clear; it thereby boosts memory retention. The calming effect of tulsi leads to clarity of thought and keep a mind more relaxed and calm disposition. The cognitive and memory-enhancing properties of tulsi heighten the memory, so it can be the best nerve tonic that sharpens the memory. Tulsi can be safely consumed regularly without the fear of withdrawal effects. Take 10-12 tulsi leaves, wash them properly and chew them slowly. Doing this every morning regularly can improve your memory power. Migraine headache is becoming common these days; it is caused mainly due to Cold, wrong lifestyle, dehydration, excessive heat of body and stressing yourself. It is attached by sensitivity to light and sound, disturbed vision, vomiting, nausea, indigestion, cold hands and feet. The pain is resulted in due to inflammation from release of compounds from nerve fibers located in the head which in turn impels the swelling of blood vessels. The pain normally occurs on one side of the head which may subsequently switch over. As Basil ( Tulsi ) contains Analgesic and Antiemetic properties, it can be beneficial in this condition and can be the best natural for it. The Analgesic property of tulsi helps to relieve headache, on the other hand. It’s antiemetic property stops vomiting, nausea that is associated with Migraine. It is easy to use take some fresh Basil leaves, dry them in shade and make a powder of it. Consume this powder ratio with 1 teaspoon powder and 1 teaspoon honey on an empty stomach. The other way is by drinking a tulsi tea, make a tea of 4 to 5 Basil leaves and drink a cup twice daily. Tulsi or so-called basil has amazing therapeutic powers that can cure a number of ailments; among them, it also keeps your heart health. It is due to its anti – oxidant element called Eugenol in it. This element helps to protect the heart by keeping the blood pressure under control and by lowering the cholesterol levels. Besides this, it also has Vitamin C and other anti-oxidants such as Eugenol that can protect the heart from harmful effects of free radicals. Chewing a few leaves of tulsi on an empty stomach can prevent and protect many heart-related diseases. Holy basil is also beneficial in defying cardiac disease and the weakness resulting from it. One of the major causes of rapid premature aging is chronic stress. Whether it positive or negative factor of Stress our body has to make a response to make changes to it or to reshape it. More often it is a psychological stress that is generally due to modern dependency to nonstop stimulation and speed. Alternatively, it can be physiologic stress such as sitting for hours every day, eating a highly processed diet, absorbing toxins from food, water, air and spending time in artificial light. Due to stress overwhelms our body’s homeostasis and inborn ability to adapt to stressing is destroyed. Due to this, our hormonal and immune systems are weakened. The inflammation flares up damaging cells, decreases energy, fatigue increases that ultimately lead to premature aging. The stress can reduce by making lifestyle changes such as eating better and exercising. The other way to reduce a stress is with Adaptogens and tulsi leaves have these properties. The powerful properties of tulsi such as antipyretic, antibacterial, antifungal, antiseptic and antioxidant balances and strengthen the hormonal. It also immune systems and give you energy as well as repair cellular damage and boost the body’s ability to adapt to chronic stress. Chewing tulasi leaves is not recommend as it contains mercury which cause harm to teeth. Tulasi is good for health but it should be swallowed and not chewed. It should not come in contact with saliva.